A couple of my co-workers have been talking about a local restaurant and a wonderful tomato basil soup they serve on occasion. While I haven’t tried it yet, I did get ‘tomato soup on the brain’ and set out to make our own at home. I wanted it to be cream-free and meatless so I needed a method that would impart tremendous tomato flavor without tasting like a can of stewed tomatoes. I took my inspiration from a recipe in Delicious Soups by Belinda Williams where the tomatoes, garlic and onion are oven roasted before being put in the soup pot. This method really makes a big difference in the flavor. Even though garden fresh tomatoes will have to wait until summer, I was happy to find these Roma Tomatoes at a reasonable price in our local grocery store. I started with 18 tomatoes or about 3.5 pounds. Any nice ripe tomato will do such as Roma or plum. 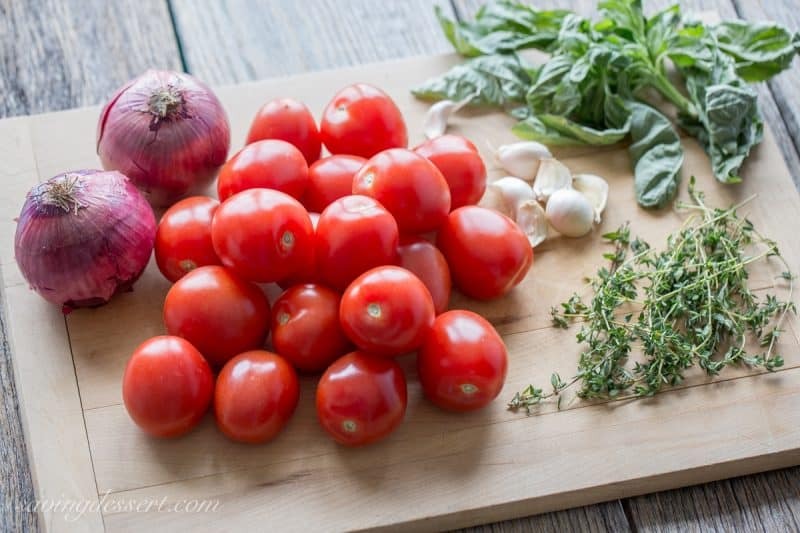 Slice the red onion into quarters, slice the tomatoes in half, add 6 cloves of garlic and toss the whole thing in 1/3 cup of olive oil. Sprinkle with sea salt and roast in a moderate (350 degree) oven. 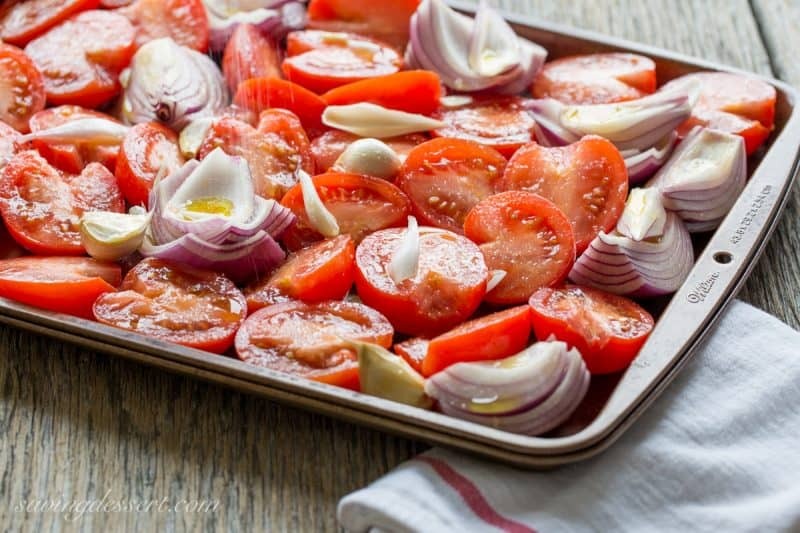 Slow roasting brings out the sweetness of the tomatoes. 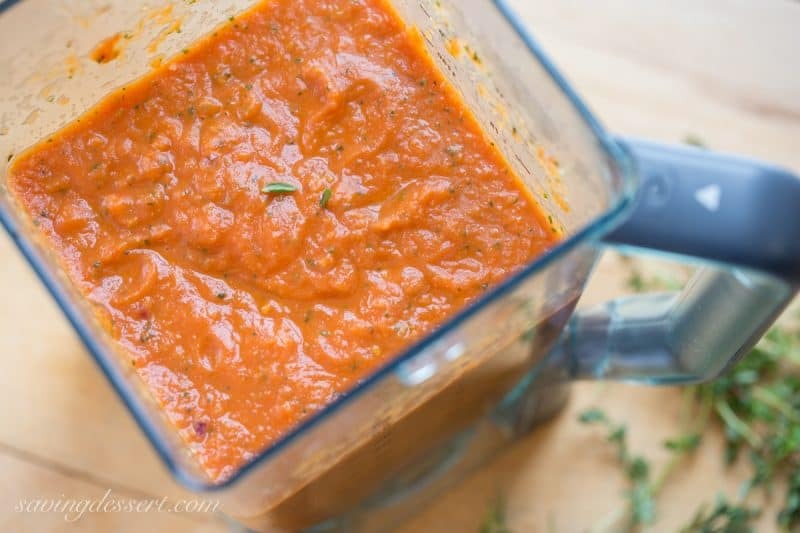 Toss 1/4 cup of fresh basil, 6 tablespoons tomato paste, the roasted onions and roasted tomatoes in a good blender. Squeeze the roasted garlic cloves into the blender and discard the skins. Blend until the mixture is almost smooth. I think this would be perfect to toss with pasta, spread on a pizza crust, or just eat with a spoon. Add a little Merlot and I think I have another recipe! Pour the puree into a soup pot and add 3- 4 cups of vegetable stock, depending on desired consistency. Season with a little granulated sugar, crushed red pepper, fresh thyme, salt and pepper and heat just until hot – do not boil. Serve garnished with fresh basil, ground black pepper and a little grated Parmesan. A big hunk of an oven fresh baguette doesn’t hurt either! 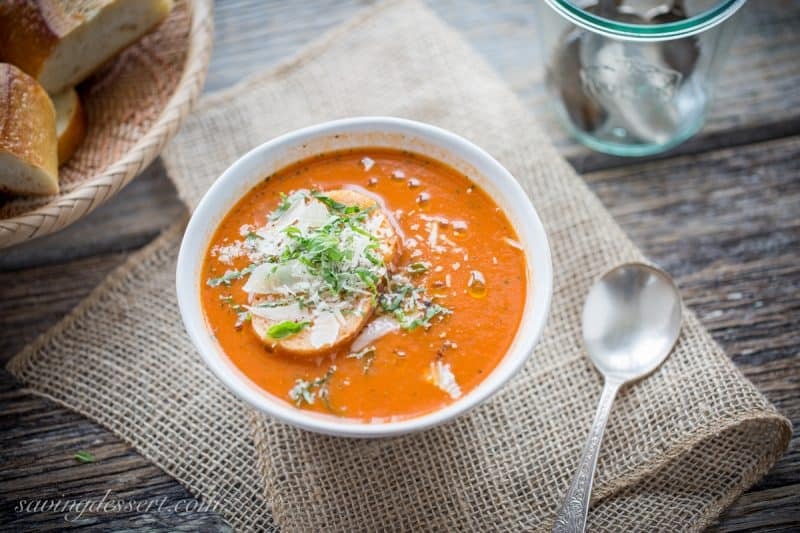 The tomatoes, onion and garlic are slow roasted to create a vibrant, smooth and creamy, flavorful soup with fresh basil and garlic. Core the tomatoes and slice in half. Add the tomatoes, quartered red onion, and whole garlic cloves to a large bowl. Drizzle with 1/3 cup of olive oil, toss to coat. Spread the mixture on a large baking sheet with the tomatoes cut side up. Sprinkle the vegetables with sea salt and bake for 30-40 minutes or until the vegetables are soft and slightly caramelized. In the carafe of a blender add 1/4 cup basil leaves, crushed red pepper, sugar, and tomato paste. When the tomatoes are roasted add them to the blender along with the roasted onion. Squeeze the garlic cloves into the blender discarding the skin. Pour any pan juices into a large soup pot and set aside. 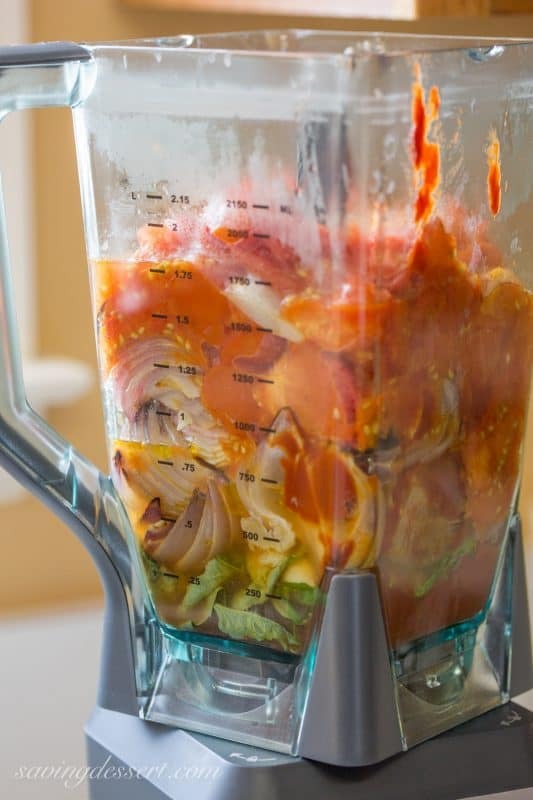 Blend the tomato and onion mixture until smooth and creamy. Pour the puree into the soup pot and add 3 cups of vegetable stock. Add up to another cup of vegetable stock or until you reach the desired consistency. Stir in the fresh thyme, salt and pepper to taste. Heat on medium until hot - do not boil. Serve garnished with a drizzle of olive oil, basil and grated Parmesan if desired. Inspired by a recipe in Delicious Soups by Belinda Williams. Well there you have it … another meatless Monday meal that doesn’t make you feel like somethings missing! Why meatless? As we get older it’s harder to keep those cholesterol numbers down so as much as as we can, we try to eat healthy, get a little exercise and behave! Happy Monday! Hope you have a wonderful week. Thanks so much for stopping by! Looks super yummy! What type of blender do you use? Thanks! We love our Ninja Blender – so much so we gave both our kids one for Christmas last year. Thanks! Thanks Michael – Soup would be great today with this ice storm – March 1st already – perhaps spring is not far behind! Me too Susan – this is a tasty soup and I can’t imagine how much better it would be with fresh from the vine summer tomatoes – love it! Wow, roasting everything made all of the difference in the world. Roma tomatoes are my favorite winter tomatoes for reliability and taste. More often than not, they are better than the locally grown Florida tomatoes we find at our local farm stand. Thanks Sam – I agree that Romas are a good winter tomato – sometimes I just can’t wait for summer garden fresh fruits! 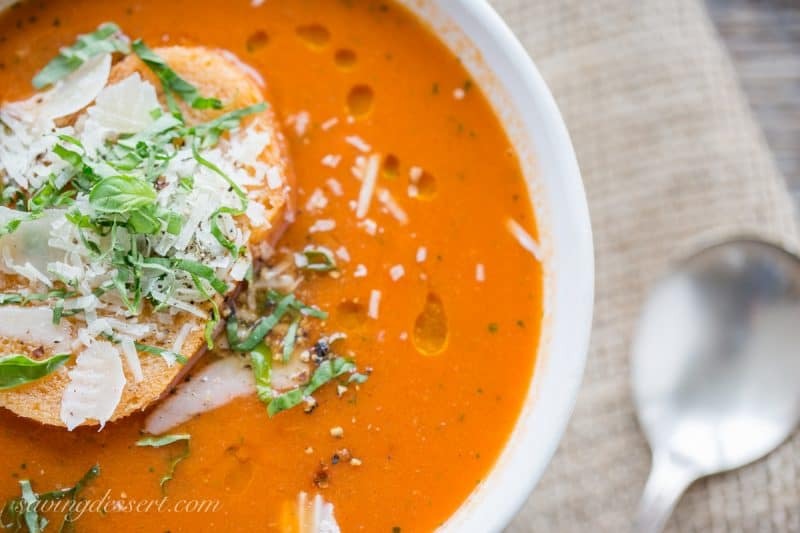 Tomato basil soup is perfect for a snowy day like today, Tricia. I love the photos in this post. 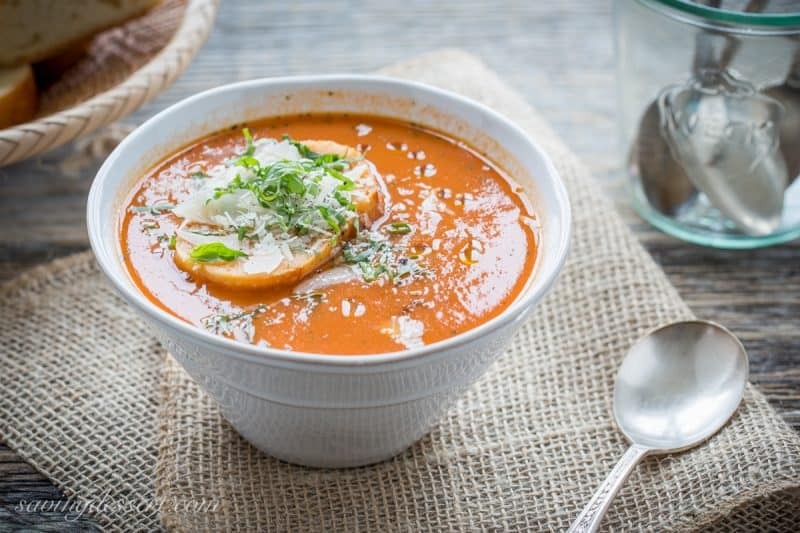 You managed to make a simple bowl of soup look so inviting! Thanks Elizabeth! Have a lovely weekend. This is one tomato soup I wouldn’t need a cheese sandwich with. 🙂 My God it looks SO good. Thanks Maureen – can’t wait to see more about your trip to Sidney. Hope you have a lovely weekend. This looks delicious and so perfect for the cold weather! Hello Bianca – hope everything is going well – thanks for stopping by! love that this is roasted with all those yummy extras like the onion and garlic! Roasting made all the difference – yummy stuff! I hated tomato soup as a kid, probably because my mom always made it from the can. Now my absolute favorite is tomato soup, but I have never made it like this. Starting tomorrow that is going to change! This looks phenomenal! I know you love tomatoes like we love tomatoes – thanks so much! I missed this yesterday! Tricia, this looks too amazing!! It is 5 degrees right now and I’m getting ready to make a far less exciting red lentil soup today. I love to get roasted tomato soup when I see it out somewhere. It is such a treat and the idea of making it at home always seemed kind of complicated. I can see it’s well worth the effort to do it. I would not miss the meat here whatsoever! I think your Meatless Mondays are working out beautifully. Stay warm…hope there’s some soup left! Thanks Monica! Red lentil soup is one of my favorites! Stay warm and hope you get to try this soon! 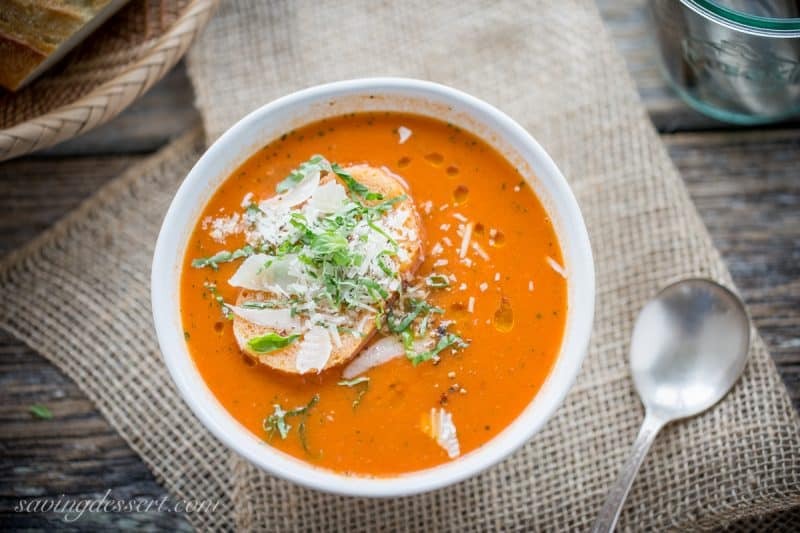 Thank you Tanna – it is a very tomato-y soup! That looks like a wonderful soup and I can just see how much flavour there is to it from the ingredients! I love roasting vegetables and always throw in some onions because they are so delicious! It is a richly flavored soup – so satisfying. Have a great week Lorraine! I do love roasting all vegetables. The days of boiling are gone! Hope you’re having a good week Betty. Thanks Becky – hope you give it a try soon! I love the garnish on this soup Tricia, it would make such a healthy light dinner, with that baguette and some wine, of course! It was a delicious dinner, and fabulous lunch and who knows – maybe dinner again! So full of flavor and not at all boring! This looks FANTASTIC! Saved it for the tomato season. It is very wonderful, fresh, delicious and healthy – hope you give it a try Angie! Great recipe! Unfortunately, living in Toronto means I may have to wait a while until the best of the tomatoes are ready. Thanks for sharing this gorgeous recipe.